Next in discussion on an indicator of quality of life in relation to GDP is Natural and Living Environment. Before we go into it, we have to understand the word �quality� and what it implies. Quality, as opposed to quantity which is measurable (He has got four houses and three luxury cars, besides other assets like shares etc), is not measurable. It depends on how you feel it; that is, quality is more perceived and perception is basically subjective. What is quality to one, need not be the same to another. This points to the complex nature of the subject. Now, how do we approach Natural and Living Environment as an indicator of quality of life? First and foremost, we have to look at how the environment is protected so that the health of the people is not put to danger. For example, we have the threatening pollution issues; air pollution, water pollution and land pollution, to mention the most popular. All countries in the world are concerned with the harmful effects of pollution on human lives and they take steps to control pollution. Controlling pollution involves huge money that is needed to be spent not once in a while but continuously. And obviously, the sum of money allotted to control pollution of all kinds differs from country to country and even for a country, it differs from year to year. With the inevitable budgetary restraint, each country is forced, according to the emergencies of the situation, to select any one area for focusing on the control of the pollution arising from that area. Now, what is pollution that looms large as an interminable menace to the entire humanity? Pollution is introducing things which do not belong to the environment with adverse consequences. When endless cars and other vehicles pass on the road, the smoke they emit pollutes the atmosphere by introducing poisonous gases in the atmosphere; when the industries discharge the unwanted things into the river, the water and the river get polluted. Global warming is much talked about by all the nations and Climate Change is the international concern. Rise in temperature due to poisonous gases like carbon dioxide, carbon monoxide prevent heat from escaping the atmosphere and they settle in the atmosphere causing rise in temperature. This is called �Green House Effect�. Global warming, that is, rise in the temperature has many serious negative consequences, affecting man, plant and animal. Now, nations across the world have turned serious attention to this issue of global warming and they conscientiously work towards minimizing the harmful effects of global warming. About two years ago, 195 countries met in Paris and reached an agreement that focuses on reducing the carbon effect. This detail is given here just to impress that environmental protection is a national agenda for all nations and they set aside considerable amount to tackle this threat to the very life of entire humanity. 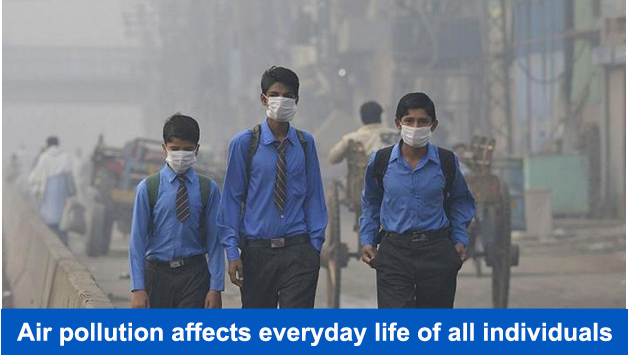 All are aware of the fact that exposure to air, water, land and noise pollution has a direct impact on the health of the human beings. Measures are taken by the countries to reduce the ill-effects of pollution like using renewable energy for transport. For example, India tries to have only electric cars by another twenty or thirty year. Economic prosperity here matters. A developed country spends more money on such issues of environmental protection while developing and under-developed countries could not set aside huge chunks of money for these endeavors. If developed countries fail to come forward to finance global warming mitigation efforts, it is pointed out that a developing nation like India will have to face economic losses of $ 1.7 trillion every year by 2050. This is a serious warning given to all the countries, both the developed and the underdeveloped and developing countries. And only prosperous countries could afford to part with massive amount for the climate change. Therefore, again, higher GDP denotes the possibility of setting aside more money to protect the lives of the human beings as well as of the animals including the marine life.